QUINTESSENTIAL DRIVING PLEASURE. 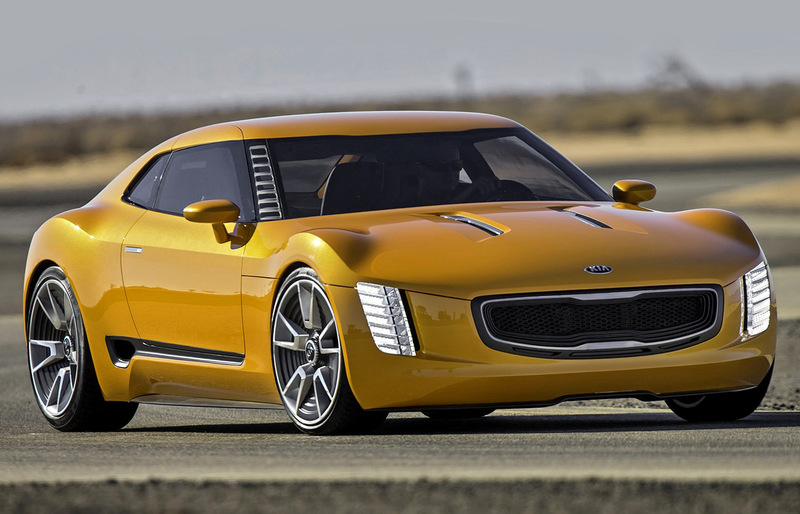 The GT4 Stinger is Kia’s most aggressive concept car ever and a true enthusiast’s machine. Hearkening back to the glory days of purebred, affordable sports cars, Kia’s U.S. design team approached the GT4 Stinger project with an eye toward weight reduction, functionality and pure driving enjoyment. The concept shuns the luxury trappings of a traditional Grand Touring car and embraces the elemental experience of truly engaging with the vehicle. FEROCIOUS POWER UNDER THE HOOD. As an authentic rear-drive 2+2 sports car, the GT4 Stinger turns heads as a daily driver and is right at home on the track too. Beneath the hood resides a tuned version of Kia’s proven 2.0-liter turbocharged gasoline direct injected (T-GDI) four-cylinder engine, which puts out an impressive 315 horsepower. That power is put to the ground via a close-ratio six-speed manual transmission driving the rear wheels, which are wrapped in 275/35R-20 Pirelli P-Zero performance tires with corner-carving grip. The result is a return to the visceral experience of driving that is at the heart of this Kia concept. As a statement of the concept’s dynamic intent, the GT4 Stinger’s sculpted “Ignition Yellow” body is underpinned by a custom chassis with independent double wishbone suspension, as well as a high-downforce carbon fibre front splitter and front-brake cooling vents. It tips the scales at a scant 2,874 pounds, and weight distribution is spread nearly perfectly at 52 % up front and 48 % at the rear. Besides two-piece 15-inch cross-drilled rotors and four-piston calipers with plenty of stopping power. The GT4 Stinger also features a quick-ratio steering rack for direct feedback and uncompromised control. Kia’s eye-catching design language moves in a bold new direction here – starting with the latest iteration of the signature grille resting mere inches from the ground. The surround glows white and is flanked by vertical LED headlamps. The silhouette is simple yet powerful, with a greenhouse design providing an aggressive side profile in homage to the iconic Kia Soul. At the back, the body widens to cover the large 275-series Pirelli rubber, while LED taillights illuminate from inside the outer edge of a blacked-out panel just above the dual exhaust ports in the rear bumper. The GT4 Stinger’s interior is purposeful in design and practical in nature. Front and centre to the driver is a thick D-shaped steering wheel and red LED-illuminated instrument panel with large tachometer and gear indicator. In keeping with the track theme and taking inspiration from sports and competition cars of the past, interior door handles have been replaced by red-stitched pull straps. Reflecting the spirit of pure, unadulterated driving, the GT4 Stinger makes do without the luxury of a stereo. Instead, the free-flow exhaust pipes will be music to the ears of driving enthusiasts everywhere.